Talks between Canada's finance ministers have wrapped up with "no consensus" on an expansion of the Canada Pension Plan, federal Finance Minister Jim Flaherty said Monday. "A significant number of Canadians are not saving adequately for their retirement," Flaherty told reporters, adding ministers did agree to ask their officials to work on options for CPP reform that they could discuss at their next meeting in June. In particular, ministers want to establish "triggers" on GDP growth and employment that would permit expanding the pension program without risking damage to the economy. On Sunday, Ontario Finance Minister Dwight Duncan had suggested there was enough support among provinces to act now on enriching the Canada Pension Plan and urged Ottawa to not wait for unanimity. 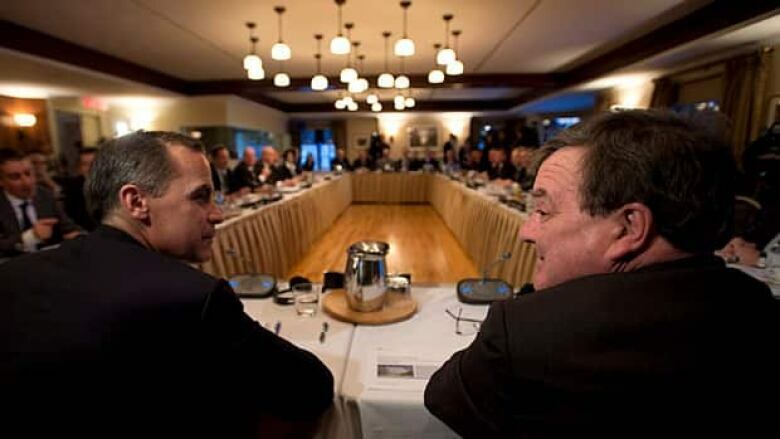 But Flaherty said Monday the two-thirds support of provinces required to move ahead did not yet exist. When enriching the CPP was discussed two years ago, Quebec and Alberta balked and Ottawa settled on the creation of a voluntary program for workers without company plans called the Pooled Registered Pension Plan. Flaherty said his counterparts Monday "overall were supportive of the idea of private PRPPs." Quebec Finance Minister Nicolas Marceau had appeared sympathetic to Ontario's position on Sunday, saying he was "open to improvement," adding he would try to work something out with other provinces. In the meantime, Quebec appears interested in moving ahead with its own voluntary pension enhancements. Duncan said his colleagues had "moved forward" on Monday but the actions taken were "still a little too slow for my taste." He also said the group needed to reach an understanding of what would be meant by "modest enhancements." "All expressed interest in looking at it," he said, suggesting provinces and territories need to establish a timeframe for reforms by next June. "The majority of provinces do want to move forward." New Democrats and the Canadian Labour Congress have proposed doubling what CPP would pay out over a seven-year period to $1,868 a month. The initiative is generally opposed by business groups, however. Flaherty made clear before the talks he did not expect anything concrete to emerge. He said the time to increase CPP contributions is when there is "significant economic growth." Duncan takes issue with Finance Minister Jim Flaherty's contention that the economy is too weak to raise premiums on employers, saying it's a "false economy" to see modest increases in CPP as an unreasonable burden after significant federal corporate tax cuts. "It will create jobs. I would ask people to think about that for a minute. This is not a tax, it is a savings plan," he said on Sunday. Duncan insisted he will not move on the pooled pension system unless there are changes to CPP, "and I suspect there are a number of provinces will do the same," he added. "It's penny-wise and pound foolish not to move on this," Duncan said, noting recent reports suggesting a "significant minority" of Canadians were going to be unprepared for their retirement with their own savings. "When the [Old Age Security] changes kick in that is going to fall right back to provincial treasuries," he suggested. Prior to Monday's meeting, the only province to come out publicly against enriching CPP was Alberta, whose minister, Doug Horner, told reporters he was open to discussion, "but right now is probably not a good time." Saskatchewan's finance minister said he would consider modest changes, but not a "radical" overhaul. On the way into Monday's meeting, other ministers spoke more positively about the prospect. "We're in favour of enhancing the Canadian Pension Plan, we think that's the way to go," said Tom Marshall, the finance minister for Newfoundland and Labrador. "We like the mandatory aspect of it... we think this is the most effective — and from an administrative, from a cost point of view — this is the most effective way to go," he said. Manitoba finance minister Stan Struthers said he was "looking for some movement" on CPP. But New Brunswick's finance minister, Blaine Higgs, said Monday morning that the timing may not be right for substantive reforms. "We think there's an opportunity to move forward on that, it's true, but the economic conditions have to be right," Higgs said. "We can't do it in any quick fashion and that's our concern." "I think what will happen is we'll have a discussion on the CPP issue and it will not be resolved because there is not a consensus," said Flaherty. While the pension issues is expected to create most of the heat Monday, federal and provincial finance ministers said the economy overall is the most serious risk facing the country. The meeting began with a briefing from Bank of Canada Governor Mark Carney on the state of the country's economy and the risk posed by a U.S. budget crisis if Republicans and Democrats cannot reach a deal to extend tax cuts and spending programs that represent about four percentage points of the American economy. Flaherty has warned Canada could be plunged into a recession if the cliff is not avoided, but Sunday said he is "relatively optimistic" of a deal, if only because both sides recognize the damage that could be done to what is still a fragile recovery. The minister said he will discuss with provinces contingency plans if the crisis does occur, however. "If we had to act to stimulate the economy again, we would," he said, adding he believes provinces would pitch in. "We co-operated very well in 2008, 2009, so I'm confident that if we were even in that spot again we could count on the provinces and territories." Flaherty told reporters that most provinces and territories are "on the same track" in planning to get back to balanced budgets in the "medium term: 2014 to 2016." Flaherty said the ministers did not discuss another potential irritant among them, the federal government's continuing desire to establish a national securities regulator. Last week, the Ontario Chamber of Commerce called on Duncan to get his "elbows out" and demand better treatment, arguing that in the last decade or so, Ontario contributed $20 billion more to the employment insurance program alone than its residents received in return. The Ontario government has complained in the past that it does not get its fair share of transfers. Duncan told reporters Monday afternoon that despite some discussion of "technical" changes to equalization, the "bigger ticket items" were not looked at. "We still put in a lot more than we get back," Duncan said, suggesting that fixing equalization might be a bigger issue among the population than provincial governments right now, and it could become an issue in the next federal election. On Monday morning, Duncan joked that Flaherty was "going to miss me" when the Ontario finance minister steps down next month.